The renovation of shops on Lee Tung Avenue continue beneath the surface. Below the pedestrianised street, the much narrower shopping strip is rushing for completion. Accessible either by escalators or the lifts in the middle of the development, the basement seems cramped compared to the shops in street level. The low ceilings were a sharp contrast to all the glamorous lobbies you see on the ground floor. I suppose this is where the developer thought they could cut costs. A signboard has been put up by the escalators detailing the layout and listing the retail and F&B leases. The Avenue has dressed up for Chinese New Year with lots of red lanterns and cherry blossom trees lining strategic parts of the street. 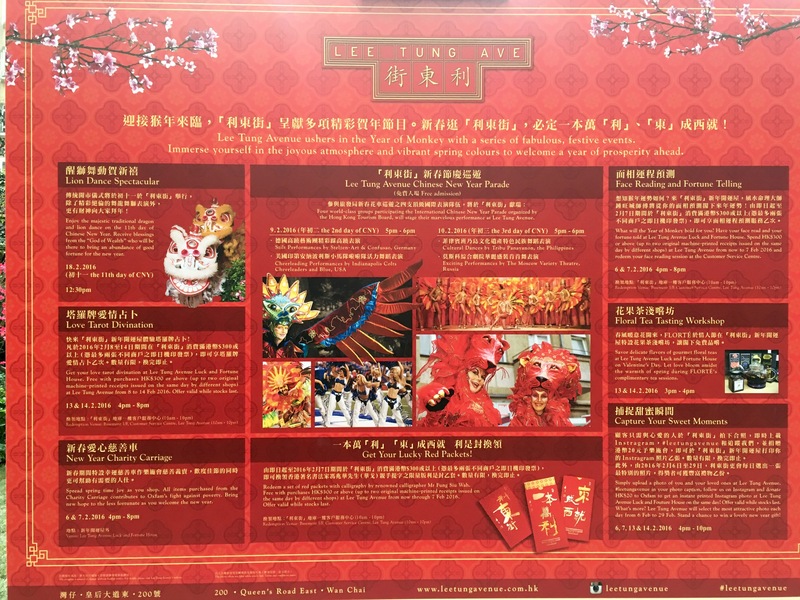 There are some special events on, chinese tea appreciation in the event venue, free popcorn and cotton candy carts placed at different ends of the street. This could be to draw people to view the shops, or to please the various viewers who came to visit the apartments for sale. There’s also free red packets if you spend over 300 HKD, although I’m not sure if this is really that attractive as an incentive to purchase anything. Finally there’s still plenty of construction workers rolling heavy carts around with rough equipment. Do be mindful getting in and out of lifts and not to let them run into you while you’re admiring the decorations. I’ve never had vegetarian Japanese food before so when SW said he wanted to invite his vegetarian colleagues out for lunch, I jumped at the opportunity to suggest Isoya. Firstly, my friend YK has been there twice since I mentioned it to her. So a repeat visit meant that it was worth trying. Secondly, it’s in my neighbourhood and a mere five minutes from our home. Walking along the busy Wan Chai road (the section between Johnston and Queens Road East) Isoya is quite invisible. Unless you happen to see the green standee sign by the building’s glass doors, you would never know it is there. Up on the 9th floor, the rather grubby lifts opens up to a lobby area with a lacquered gold wall and immediately, a feeling of unexpected tranquility. Get through the traditional Japanese cloth doors and the space opens up to a bright, minimalist dining space which is spacious and clean. The tables were well arranged so that there was plenty of space and the furniture itself looked versatile and light. We sat near the windows, the outside light muted by translucent window blinds. It lent a discreet yet natural atmosphere. The menu is available in chinese and English. Essentially you have a choice of either a light set meal consisting of 2 starters, a main course and dessert or the deluxe set which allows you to select 3 starters and a main course, with a sushi platter and some tempura thrown in. We decided to get one light set and one deluxe set to get a feel of the range. For the starters, we chose the avocado salad, cabbage, egg plant and the yam-sesame pancake with skewered tomatoes. All were relatively small portions (for example there were just two smallish pieces of eggplant in a small sauce bowl) but fairly tasty. I liked the avocado salad and the yam pancakes the best. For the mains, I got the tofu udon to share with the small person and SW got the vegetable curry rice. I thought the udon portion was fine but the soup was a little too sweet. Perhaps it’s hard to get this right without the meat broth component. SW enjoyed his vegetable curry rice although he found it surprisingly spicy and slightly bitter. The sushi platter was interesting if a little basic. The balance of vegetable to rice could have been adjusted so that the vegetables equalled the rice. For example the yellow pickle was just a sliver, the roasted vegetable was sliced so thin that you couldn’t really taste it. Great presentation though. Definitely made us feel like eating it. My suggestion would be that the chef should be more creative, maybe multi-layered vegetables or hand rolls. The dessert, green tea mochi with a cream filling, was very nicely done. Not too bitter and not too sweet. The texture was perfect. My thoughts are that this restaurant does well in aesthetics but it would’ve been good if they could make the vegetable components heartier. The carbohydrate portion seemed to overwhelm the meal, and it was a pity that the vegetarian restaurant had to resort to fillers when there could be so many interesting ways to present wholesome vegetables exclusively. Having said that, the flavours certainly seemed more natural than many other chinese vegetarian joints which rely greatly on sauces and condiments to emphasise flavour. We left feeling full but got hungry pretty quickly after, but that may be normal for vegetarian food. There’s plenty of space for prams and strollers, ikea high chairs are available and child friendly cutlery. I think most kids could find this vegetarian place appealing. Service was top notch and the rice tea was served warm in a double lined glass which was a nice touch. The small person wanted noodles two days ago, so we headed straight to Maureen’s. Sliding open the glass door, I saw Maureen and crew busy behind the counter. “What’ll you be having today?” Maureen asked breezily. “I was thinking salmon today” I replied. She described an individually slow cooked crock pot rice that she thought would go well with salmon, slow cooked and usually prepared for dinner. However as we were early and it was a cold, slow day, she thought it would be nice to offer guests who were opting for the salmon. Of course we were happy to try it. The entire set was the same with the exception of the rice. It came plain, topped with an egg and a lacing of spring onion. Maureen was concerned whether small person would enjoy it. She needn’t have worried as she ate half the bowl of rice. I had all the crispy bits at the bottom which was quite satisfying. Overall it was a good combination with the salmon but I have to say that the texture of the noodles is more addictive than the rice. It is nice to have the option though, and to try something new. On one of Hong Kong’s oldest days in twenty years (7 degrees Celsius), we still needed to walk and find ourselves a decent lunch. The restaurants along Landale Street have been slowly renovating over the last six months. The older clay pot shops and Vietnamese noodle joints have been pushed out and replaced by more fashionable fare. One of these is Pop It. Concrete slate grey exterior with matte powdered black window frames, it’s hard to tell what it’s selling without checking out the menu. Fortunately they had the good sense to display a menu by the doorway so that all passers by can peruse it without having to peer in at the menu hanging on the inside wall. We went at 11.30am, there were no other customers yet. The interior was large and well laid out. High tables with high stools on one side and a table of normal height nearer the door. One of the guys in a black cap and heavy American accent greeted us warmly and invited us to sit wherever we liked. The small person chose the table furthest from the door… Less of a draught… I agreed. “Anything to drink?” He inquired. 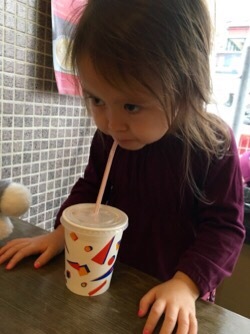 “A bit cold today for sodas or milkshakes” I said, gesturing at the menu. What thoughtfulness and service. I liked him already. I ordered a naked dog for the small person and a New Yorker without the 2 types of mustard for myself. A DIY kind of place, they filled their ledges with the widest variety of chilli sauces I’ve ever seen. It was very impressive. The set comes with a hot dog and fries, you can also add a soda if you want it as a combo. While we were there, the tables did fill up a bit. A group of young British and American men in suits came in for lunch, as did two very trendily dressed local guys. Then a fairly hip chinese couple wandered in after looking at the menu outside. The verdict? Hot dog buns were nicely buttered but the sausages were a bit on the small side. Fries were good but I ate half of the small persons so that means ordering just one set might leave you hungry quite soon after. My sauerkraut was good, I liked it on the dry side so that it doesn’t soak through the bun. There was space for my stroller and enough corridor for the small person to wander around post meal. My former Bodycombat instructor KevinL from Kuala Lumpur (KL from KL, haha) came to visit just before Christmas with his friends Vincent, Janelle and Nikki. They stayed in Mong Kok but I managed to get them to come over to Wan Chai for the morning. After a high caloried breakfast at Kam Fung Cha Chaan Teng, where between them they must have tried every variation of noodle and bread combo, we headed for a short time to the swings across the street. A short burst of energy to entertain the little one and a quick look around Wan Chai market got their tummies rumbling again after barely half an hour. “I remember a really damn shiok curry fishball place in Wan Chai” said Vincent. His eyes were bright with enthusiasm and suggestion. “Ya ya lets go find it” quipped Kevin. “I recall its near Wan Chai MTR”. So our little war party of six made our way threading through the hoardes of shoppers browsing Tai Yuen Street. At the MTR exit, Kevin pointed at the overpass indicating that we head up. “It’s over on the other side, near California Fitness” he said. I encouraged them to look on either side as we made our way above Hennessy towards the Convention Center. Vincent got quite excited once we got into Lockhart, “I think that’s it” he pointed down. We descended via the newly installed glass elevator to street level and crossed the road. 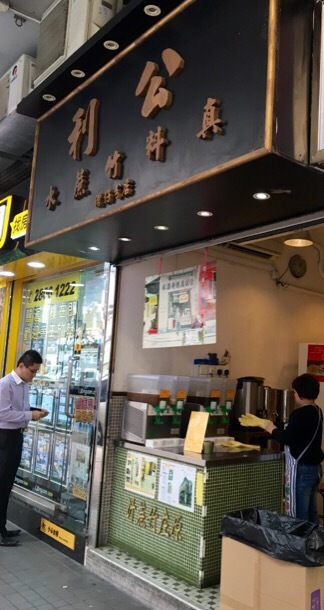 A shoplot stall comprising of a few sections selling everything in Hong Kong fast food you could want to eat for breakfast, lunch or dinner is available here. It looked like a place that catered to the late night denizens, clientele and possibly taxi drivers plying the area for their trade. In the daytime it was relatively quiet. At 11.30amit looked like they were just opening up the stall for lunch business. Small steel vats contained various bubbling soups. One of these contained the curry Fishballs that they yearned for. The serving lady ladled the curry soup with its contents into a styrofoam bowl and supplied each bowl with a wooden skewer stick. Each of them got their own bowl while I pinched a fishball of Kevin just to try ( I was still stuffed from breakfast…). Was it as they remembered? Kevin and Vincent ruefully said that the Fishballs used to be bigger and better textured. But they enjoyed the curry soup and slurped it all up while on the pavement. I wish there was a more decent place in Wan Chai that sold Hong Kong snacks more stylishly. A place where you could really bring guests and sit down to enjoy talking and savouring the snack. If they put one in the Blue House, I think that would really draw the crowd. See you next time Kevin and co.! In a presently more secluded and less commercial part of Wan Chai, some noisy and active renovation is taking place. The Blue House is surrounded by construction boards, stacks of steel re-bar and cement trucks. It should look good once the developers are done with it. Across this temporary but rather messy environment, a purple canopy is extended Monday to Saturday between 10am to 9pm. 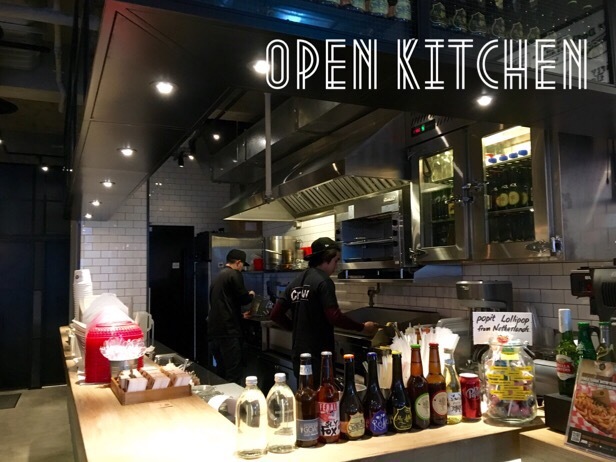 Chef and owner Maureen Loh can often be found working behind the bar like kitchen counter in her matching purple chef’s shirt, checking her timers or temperature settings on her various sous vide machines. Her two excellent chef assistants and waitress start early, weighing noodle portions and setting up the kitchen for the day. Maureen’s specialty is noodle sets with an array of accompaniments, all evenly cooked through a process of heated water 60 degree Celsius permeating its heat through a bag containing the meat. The proteins are uniformly teased into a palatable form and absorb the flavours of the accompanying herbs and sauces. Almost everyone will find a meat that will work for them. Chicken, beef, lamb, duck, pork and salmon are the mains, while accompaniments are abalone in the pricier sets, the cheaper sets include an egg and simple salads. 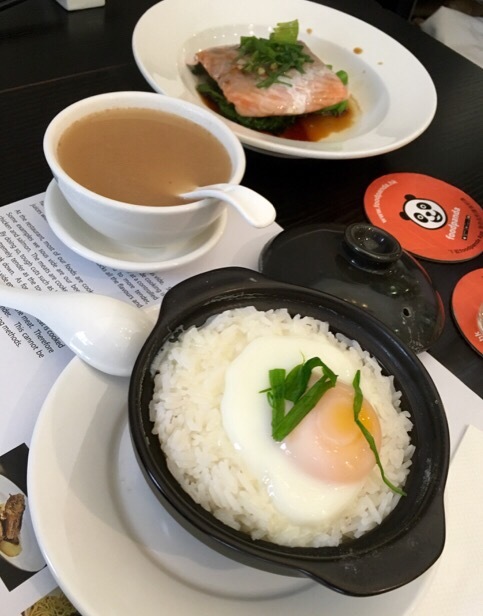 Lunch sets range start from about 100HKD and upwards. It includes soup, salad and the noodles. I’ve tried almost all the sets and all are good but it does depend on what sort of taste you’re after. I ordered the chicken set with the tangy lemon sauce. Unfortunately I ate it all before I could take a photo… But you can get an idea here. I’m a huge fan of Maureen’s and am there at least once a fortnight. You can almost always get a seat before twelve noon but lunchtime 12-2pm can bring in the crowds and you may struggle to get a seat. Maureen has a daughter of her own who occasionally comes by the restaurant. She takes care that the food is wholesome and healthy. The restaurant isn’t designed for children, there are no high chairs or kids cutlery but the staff are very friendly towards children and will do their best to accommodate them. There’s only space for one pram in the restaurant so it’s best if you can bring your kids without one. You can now also order her noodles through Food Panda for takeaway. 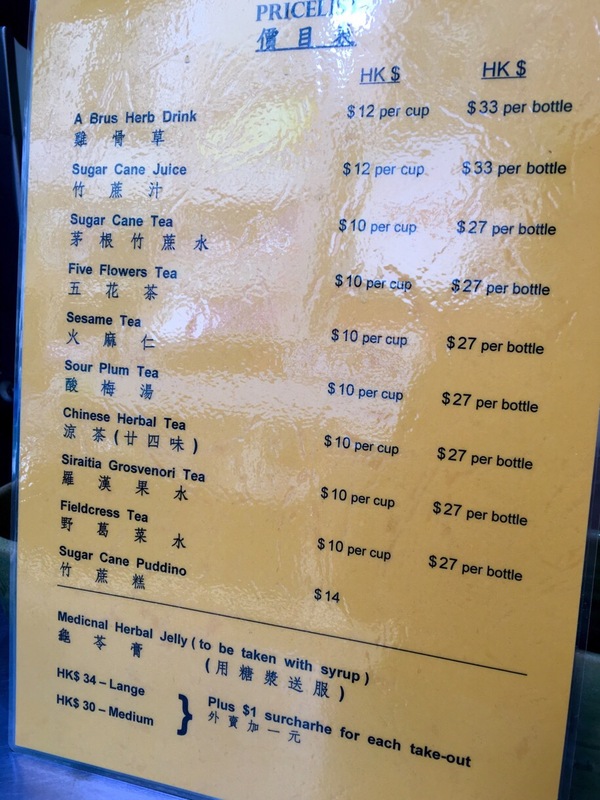 Situated between two property agents at the Southorn playground government building, a little shoplot plies its trade in simple Chinese herbal teas and the better known turtle herbal jelly. Their specialty is sugar cane and the fresh sugar cane juice is absolutely delicious. I buy them in bottles. Refreshingly sweet, cold and thirst quenching. It’s a wonderful summer drink. In the wintertime, they can warm up any tea you want. Today we had the five flowers tea (五花茶) which was so good we had two cups of it. They were promoting a special sugarcane water chestnut dessert for Chinese New Year. 120 HKD a pack. I plan on giving it a try. They’re accepting orders already, usually for collection the same day. If you need to rebalance your yin yang energy levels in Wan Chai, this little tea shop is a good stop. At least they have two or three small tables for you to sit and enjoy your drink… A luxury that most of these herbal tea shops cannot provide.